This great value island hopping holiday allows visitors to discover three unique Caribbean islands from around £2000 per person. The 10 night holiday include stays on the buzzing island of Barbados, the charming island of Bequia in the Grenadines, and the beautiful island of Grenada. 10 nights from £2080 per person including all flights, transfers and accommodation as above. Sample price is for travel in low season, staying in the lowest room type and include current special offers. Start your holiday by flying to Barbados, where you stay for 3 nights at South Beach Hotel on a bed & breakfast basis. 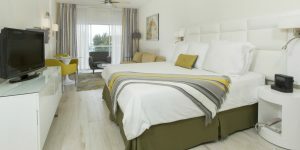 The modern hotel is located on the island’s south coast and is idea for those who wish to relax and explore the surrounding area. 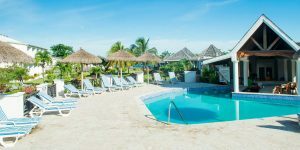 The popular Accra beach is just across the road from the hotel and there are plenty of renowned restaurants and lively bars nearby. 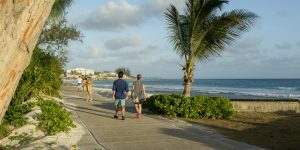 Slightly further afield are numerous places of interest including rum distilleries, botanical gardens, historic mansions and interesting towns such as Speightstown and Holetown. Visitors can also take part in plenty of activities including water sports and golf. Barbados is known for the soft sands and turquoise waters of the west coast, with the rugged east coast of the island providing a contrast, home to rugged surf beaches and a scattering of local villages. Find out more about things to do in Barbados. 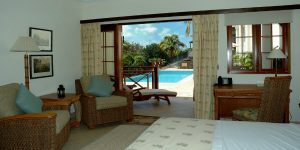 From Barbados it is just a 45 minute flight to Bequia, a charming island in the Grenadines where you stay for 3 nights at Bequia Beach Hotel on a bed & breakfast basis. 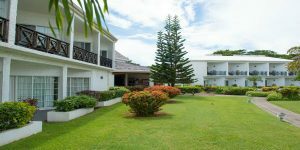 The colonial-style hotel combines luxury, elegance and charm, with many of the spacious suites offering views of the natural beach. The hotel boasts a relaxing, friendly atmosphere coupled with a first class restaurant, beautiful infinity pool, secluded sandy beach and far reaching sea views. The hillside restaurant serves Italian dishes in a romantic setting, while Bagatelle’s beachside veranda is the perfect spot to enjoy a fusion of Caribbean and international cuisine. Bequia itself is small enough to feel typically Caribbean yet large enough for guests to get out and explore the many beautiful beaches and plantations inland. Yacht charters and boat excursions allow visitors to explore the nearby islands of Mustique, Canouan and the Tobago Cays. 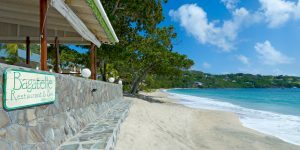 Board a flight from Bequia to Grenada, where you stay for 4 nights at Coyaba Beach Resort on an all-inclusive basis. 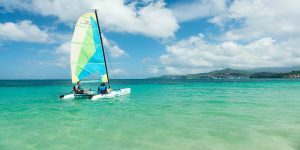 Coyaba Beach Resort is set within five acres of tropical gardens beside the famous Grand Anse Beach and offers a great range of complimentary water sports as well as tennis and yoga. Outside the resort, excursions allow visitors to discover Grenada’s varied landscape including mountains, rainforests, rivers and waterfalls. The underwater sculpture park is perfect for snorkelers and scuba divers while more cultural activities include visits to the Rivers Antoine Rum Distillery and the Belmont Estate chocolate plantation. Find out more about things to do in Grenada. After your stay in Grenada, fly back to the UK. Flights with Virgin Atlantic in Economy from London Gatwick to Barbados and from Grenada to London Gatwick. Inter-island flights with a local airline from Barbados to Bequia and from Bequia to Grenada. 3 nights’ bed and breakfast at South Beach Hotel sharing a Junior Suite. 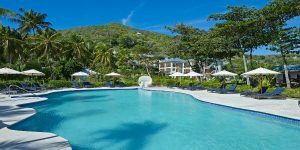 3 nights’ bed and breakfast at Bequia Beach Hotel sharing a Classic Pool & Sea View Room. 4 nights’ all-inclusive at Coyaba Beach Resort sharing a Garden/Pool View Room.